Donald Trump won't be pleased that newspapers and websites were full of 'fake news' today but it was all part of the annual April Fools's Day tradition. The American President is fond of criticising media outlets when they publish articles that do not agree with his version of events. What he thinks of the story in this morning's Irish Times is anyone's guess. The newspaper reported that Mr. Trump bought Liberty Hall and has plans to develop a 32 story hotel, twice it's current size and the same height as The Spire. Amazon introduced Petlexa! The Petlexa feature allows dogs, cats, and other animals to communicate with Alexa just like you do. The UK will not participate in the Eurovision anymore. Emirates have announced details of their new commercial aircraft, the APR001. Emirates unveils plans for the world’s largest commercial aircraft. The triple-decker APR001 includes a swimming pool, games room, gym and park. Prince Harry got married in secret. Chill Factore in Manchester is opening a new snow-boarding school for dogs. The Beano is replacing words with emojis. Burger King has developed Whopper flavour toothpaste so you can enjoy the flame grilled flavour all night long. 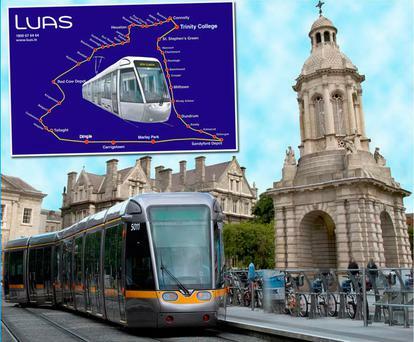 The Irish Independent report the Luas takes a detour through Trinity college with a stop at the famous bell tower.